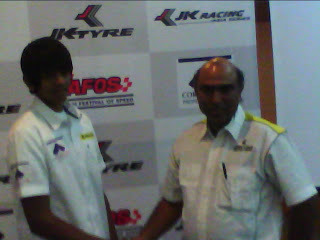 JK RACING ASIA SERIES 2011- 16 YEAR OLD BANGALORE LAD RAJ BHARATH TO PARTICIPATE. Indian karter and JK Tyre prodigy Raj Bharath is all set to participate in the JK tyre Asia series and is being supported by Cornerstone properties Private Limited. The series is the most popular stepping stone for aspiring drivers in the Asia Pacific, will kick off at the Sepang International circuit in Malaysia on 8-10th April.JK tyre has always been in the forefront to promote young budding motor sport enthusiasts from the grass root level in the country. VIJAYA BANK opened its 21 st Regional office at Pune. The Regional office was inaugurated by Mr.Baba Saheb Kalyani,prominent Industrialist in the presence of Mr.Albert Tauro,Chairman &Managing Director of the bank. SANKARA EYE HOSPITAL-VARTHUR MAIN ROAD,KUNDALAHALLI GATE,BANGALORE. Telephone:080-2854 2727/28/29. Sankara eye hospital announces campaign to raise awareness on early detection and treatment of Glaucoma.Organises free screening and educational programmes from March,6 to 13th. Addressing the media,Dr.Meena Menon,Head of the Glaucoma services in the hospital said," since Glaucoma may not have early symptoms,the first step would be to be aware of the risk factors.If left unchecked, it could irreversibly damage the optic nerve and result in vision loss over a period of time". 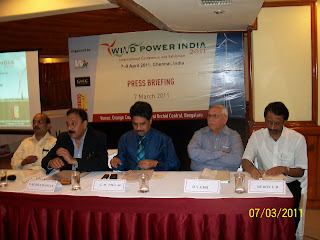 An International Conference & Exhibition WINDPOWER INDIA 2011 Will be held on 7th to 9th April,2011 at Chennai Trade Centre Complex.The Seminar will showcase some of the choicest wind investment oppurtunities in the Indian Wind Power Sector. On this occassion,A Wind Power Development Report will be released jointly by The Global Wind Energy Council (GWEC),The World Institute of Sustainable Energy (WISE) and The Indian Wind Turbine Manufacturers Association(IWTMA). There will be panel discussions by experts to suggest recommendations to the government and initiate innovative policy measures for encouraging growth of the wind sector in India. As per National Action Plan on Climate Change, 15% of the country's requirement of power should be met by renewable energy i.e by solar and wind energy. As wind energy is the clean energy, the government should give all thrust to this sector. A major highlight of this Conference will be the presentation 'Wind India Awards'. These awards are an initiative of WISE and was first instituted during WIND INDIA in 2006 held in Pune. Mr. V.Subramanian, Former secretary,Ministry of New and renewable energy Govt. of india and Chairperson,organising Committee, Mr.G.M Pillai,Director general, World Institute of Sustainable Energy(WISE) and Executive Co-Chairperson pf the conference and Mr. D.V.Giri,Member, Advisory Panel,WPI 2011,and vice chairperson GWEC and Chairperson,IWTMA,Chennai addressed the media. MANAPPURAM MISS QUEEN OF INDIA 2011. 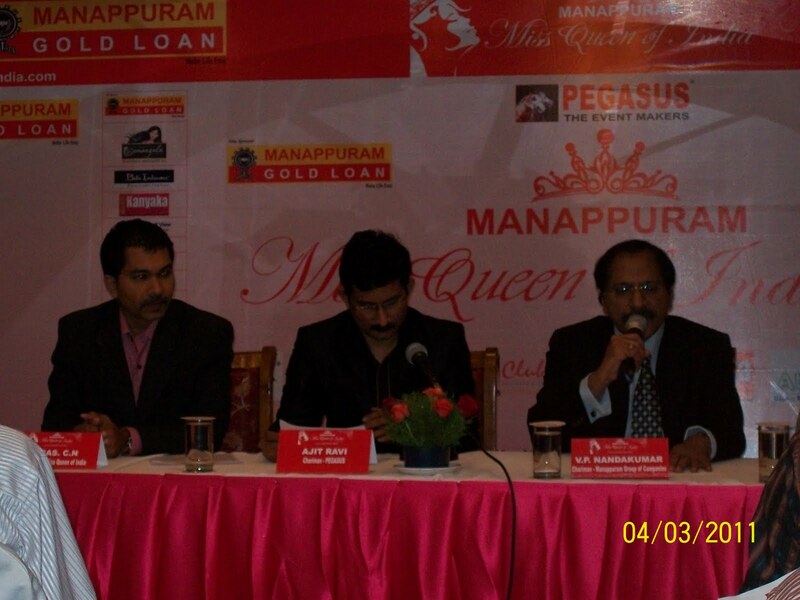 Mr.V.P.Nandakumar,Chairman of Manappuram group of companies announced that Manappuram Miss queen of India 2011 will be held on 9th march, at 6.30 P.M at the Golden Palms Resorts ,Bengaluru.The sixteen contestants from four regions of the country will participate in the finals.The auditions were held at Mumbai,Delhi,&Kolkata. The event will be organised by Pegasus,the event managers for the show.